By the early 20th Century greetings postcards had overtaken folder cards in popularity as they were cheaper to post. A ban on Christmas cards to conserve supplies of paper was mooted during the First World War but the idea was abandoned in the interests of maintaining the troops' morale. 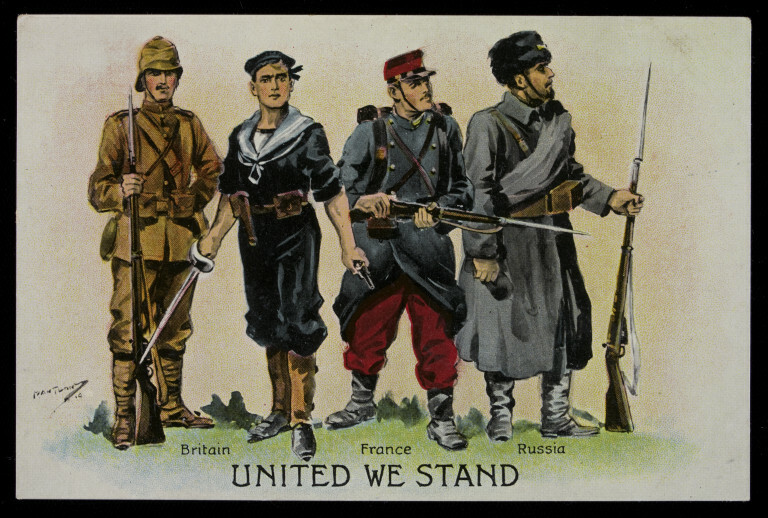 This propaganda postcard celebrates the alliance with France and Russia. Postcard (landscape format). 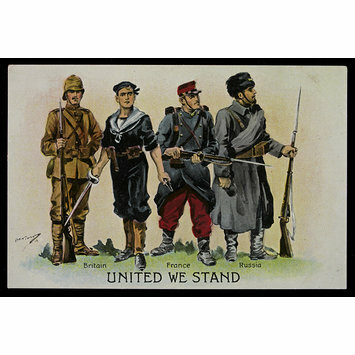 On the front: colour printed illustration depicting allied servicemen from Britain, France and Russia, with captions under the figures and the legend 'United We Stand'. On the back: postcard template printed in grey. This postcard formed part of a group transferred from Photographs to Prints for accessioning. In the process of cataloguing them and releasing them from the boards onto which they had been mounted it was discovered some of the postcards had already been numbered with 1969 numbers (now noted in the 'other number' field as 'numbered in error'). When the Photographs accessions register for 1969 was consulted two unrelated groups of material with the same run of numbers was discovered. One of these groups, which included this postcard was credited as being 'Given by Mrs Harrington'. Registry could find no record of a donation from a 'Mrs Harrington'. Postcard, letterpress on card, printed and published in Britain, World War I, 1914-1918.